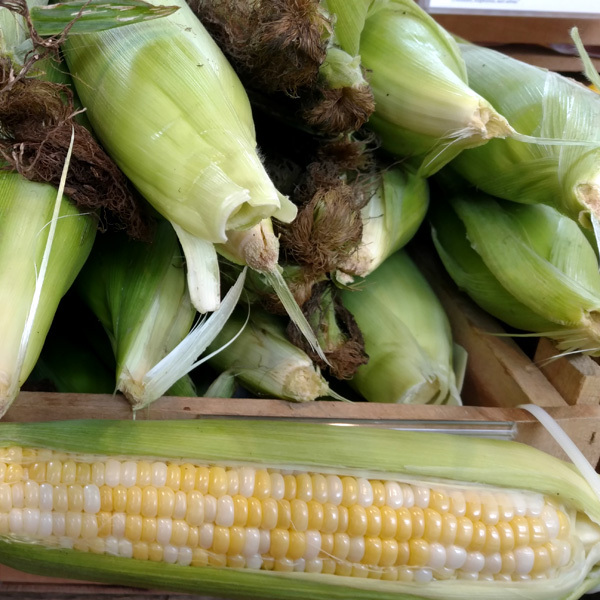 Bulk sweet corn deal by pre-order only! We’re seeing some prices come down: red tomatoes, WATERMELON, and, not so much because of the season, Caputo Brothers Creamery CapoMozz. There are a lot of very cool things happening in the local food scene. This week, I kicked myself for not having more fully explored one of them until now — Caputo Brothers Creamery in Spring Grove, PA.
I’ve written before about how much I like their mozzarella curd products, especially their new CapoMozz, which makes the stretching process nearly fool-proof, and some of you have bought packs of the Cagliata or CapoMozz to try out yourselves. This week, following a visit to the Caputo’s plant and store in southern York County, we’re also featuring their Ricotta Salata Vecchio, while supplies last! The Caputo Brothers are actually husband and wife team David and Rynn Caputo (well, the brothers are really their two young sons, but Dave and Rynn are running the business for now!). They fell in love with Italy and its stretched cheeses early in their marriage, and quit their corporate jobs to learn about (and bring back to the US) Italian food. How they wound up in southern York County is not entirely clear to me. If we operated a gourmet store, rather than a local foods store, we would be stocking their CapoMozz and other cheeses. Happily, we’re able to do that anyway, since they are both gourmet and local. All Caputo Brothers cheeses are made with Apple Valley Creamery milk — that is, the same milk we sell at R&R — though this week, Rynn told us, they have also started buying some Jersey milk from a very small, very young, very new farmer who got his dairy operation Animal Welfare Approved so that he could sell to Caputo. I’ve been really impressed that they’re using Apple Valley milk, and I’m also really impressed that they’re pushing other new farmers into using humane and sustainable methods — and making it worth their while to do so. What really sets the Caputos’ mozzarella apart from anything else you can buy in this country, though, is how the cheese is made. Most mozzarella — and if you’ve ever made mozz from scratch at home you’re probably familiar with this method — is made by acidifying milk with citric acid or vinegar. This essentially curdles the cheese (hence the word “curd”), creating a passable mozzarella, but not one in the Italian tradition. A “true” mozzarella (other than being made with buffalo milk), is actually a cultured (read: fermented) product, where the milk is acidified not through the direct introduction of acid, but through the introduction of a culture (bacteria like lacto bacillus) that go to work eating the sugars (such as lactose) in the milk and acidifying it as a by-product. This, in turn, causes the milk to curdle, and creates as much tastier — and easier to digest — fresh cheese. The first time we had a caprese salad with home-stretched cheese from the CapoMozz, we were blown away — it was probably the best mozzarella we’d ever had. While we were at the plant, Rynn also showed us an even easier method for making the cheese than those they have instructions for on the website — probably because it’s so easy, there’s nothing to instruct — thaw the curd in its package by placing it in cool water for 30 minutes. Heat a pot of water on the stove to 190 degrees, turn the heat off, throw the curd (still in its package) into the water, and set a time for two minutes. Pull the pack out of the water, cut it open and pour it into a bowl, add a teaspoon of salt, and shape it balls or a log or whatever’s appropriate for your use. Put it into cool or lukewarm water until you’re ready to use it. Anyway…I don’t meant to sound like a mozzarella zealot over here or anything, but I am a little obsessed with both how incredibly delicious the cheese is — I mean rich, creamy, luxurious — and how cool it is that it’s being made in our proverbial back yard, with what we think is the best milk around. Sometimes I feel very lucky to be here, at this time, with these people — and then I think, well, “Could we find farmers like this anywhere we went?” I am pretty sure that we couldn’t — we’re in a fantastically fertile area, and many of our farmers rank up there with the best people I’ve ever met — but I know that we couldn’t get cheese like this and call it local anywhere else. But you don’t have to take my word for it — the American Cheese Society just named the Caputos’ Ricotta Salata Vecchio the best “Traditional Regional Italian Cheese” of 2017. And you can get it at the Broad Street Market. How about that?